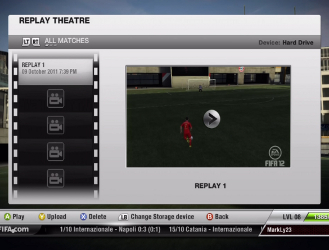 The returning Replay Theater of FIFA 14, which debuted in FIFA 11, organizes your replays into one space, and provides a place to view your saved replays. FIFA 14 automatically saves your highlights of the game such as goals, close misses, shots, etc. This way, after the match you can pick and choose which highlights you would like to save to view or upload later without having to pause during the game to save an instant replay. This also eliminates the old problem of replays in online matches, previously you couldn't pause online games to look at instant replays, so the only way to record online games was through an external capture device. However, I would recommend using a good quality, external capture card of some sort if you are planning on making goal montages or tutorials pertaining to FIFA, as the quality is rather low on FIFA's replay system when uploaded on to your EA Sports profile, but it would work if it is your only option.